The silhouette of a Prang, a Thai style Stupa, stands gracefully against the vibrant colored sky in the twilight. The color displayed on the sky amazingly changes from searing orange to gentle red than fades down to dark blue until the darkness sweep over the sky. We proudly present you one of the most memorable bicycle tours in Bangkok, Bangkok Best Time Cycle - Ride in the twilight. This is the special bicycle tour. 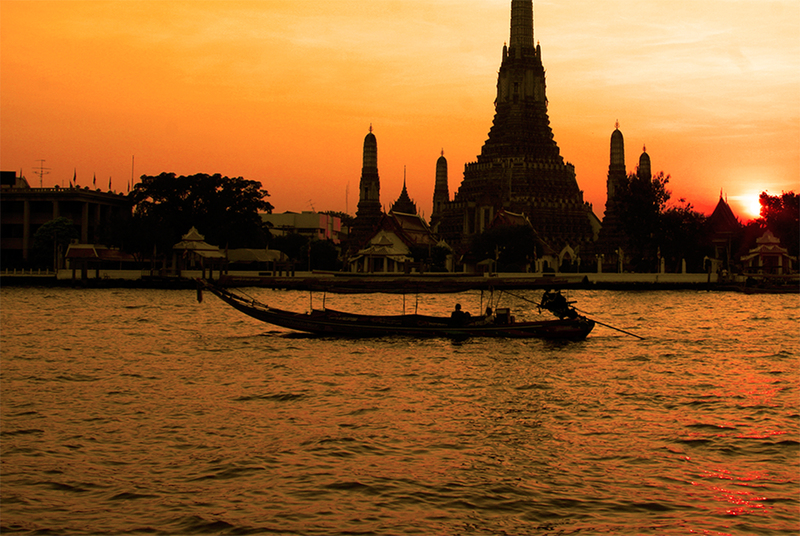 By choosing the start time just before dusk and carefully planning the time frame to be at the right spot at the right moment you'll be able to experience the best the night has to offer in Bangkok. Start cycling from Samsen 4 Road at 3.30 pm heading to Chao Praya River. Riding on the small lane passing through the local community.You will witness local life, street vendors preparing their merchandise and heading up towards Kao sarn Road, school boys and girls are taken back home by variety of vehicles, housewives preparing dinner for their family. All of these are the life of people before the end of another busy day in Bangkok. 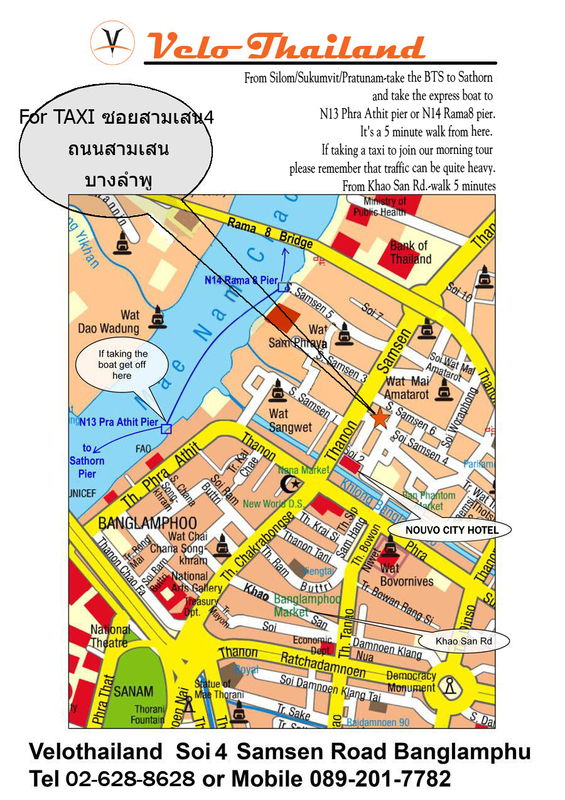 After taking a break on the Rama VIII bridge and enjoying a panoramic view of the Chao Praya River, we will resume our ride crisscrossing through small lanes along the river to board a boat cruising down the river in time to watch sun set in front of Wat Aroon. Once disembarking from the boat, Wat Pho, where the most beautiful reclining Buddha image of Thailand enshrined, is our next visit. During the day time, here in Wat Pho is over crowded with tourist but when the nightfall, few tourist is present and will be the best time for you to admire and take a photo of the most beautiful reclining Buddha image of Thailand. Meet at the Velo Thailand Cycle Shop, Sam Sen 4 rd. at 3.30 pm. After a quick bike fitting and briefing we will head out. Staying off the main roads, Bike riding through the back road, we wind our way through small laneways, passing ancient temples and canals along the way so as to experience the fascination of Bangkok. We finish back in the Khao San Road area which around this time is just starting to build up for another big night out for the backpackers who stop over here. The tour usually takes 3-4 hours but this is variable by group. Dinner is not included in the tour but we do include some fun and tasty snacks when stopped at the local market. We cycle about 15km on flat, Anyone who can ride a bike can do this ride.